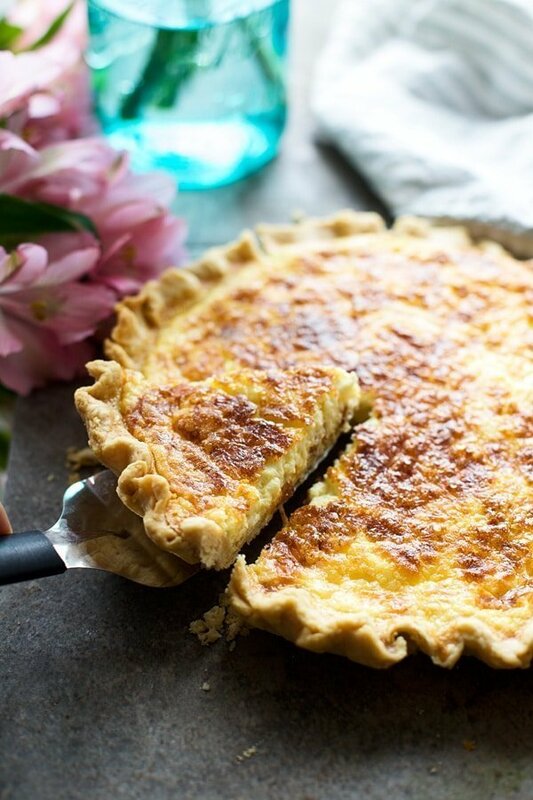 Thanks to a heavy hand of nutty gruyere and emmental cheese, a light-as-air filling, and a super flaky crust, this is the Best Ever Quiche Lorraine! Bring to your next brunch, baby or bridal shower, and everyone will be totally smitten, with this quiche, and with you. Titling a recipe, “Best Ever,” is a bold move, but after years of taste testing, a lengthy brain-storming session, and several failed attempts prior to today, I’m confident enough to say that this is indeed the best homemade Quiche Lorraine I’ve ever had, and after you try it, I’m, willing to bet you’d agree. Admittedly, I don’t think quiche in general elicits feelings of bliss, and I’ve been told by several people that it actually just makes them think of the elderly (ahem…Kevin). 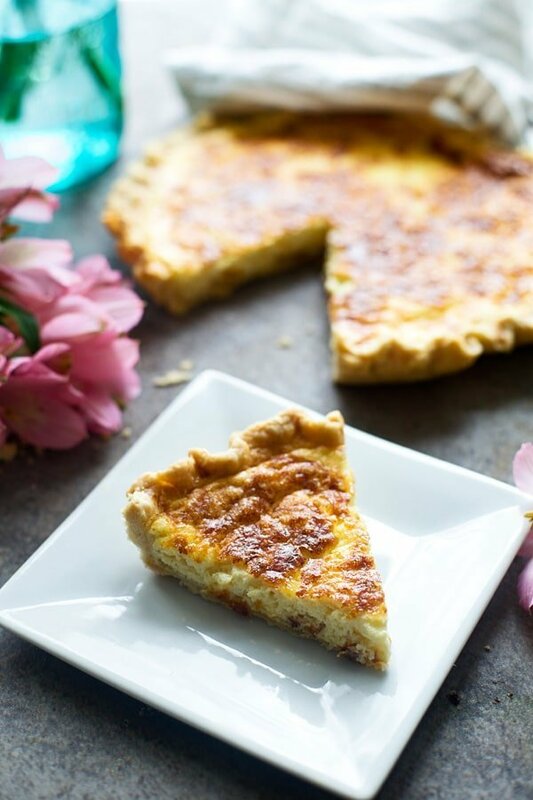 However, if you have ever had the Quiche Lorraine from Andre’s, here in Kansas City, quiche would not only prompt feelings of bliss and instantaneous drool sessions, but it would become your new favorite dish, and something you most certainly couldn’t survive without. If you noticed previously, I strategically noted that today’s quiche is the best HOMEMADE quiche I’ve ever had, that’s because Andre’s is the BEST quiche I’ve ever had, and though I tried, it sadly, cannot be replicated at home. Their quiche is unlike anything I’ve ever tried. It’s light and airy, but sturdy. It’s ridiculously cheesy, but not overwhelming so. The crust is crunchy, and juuust on the verge of being cooked too long, which makes is absolutely perfect. In short, it’s something I could eat ever single day for the rest of eternity and be totally content. My dream has been to recreate it identically at home, but I think I’ve come to terms with the fact that it’s just not possible. So while today’s quiche isn’t the exact Andres recipe I’d hoped it would be, it’s THIS CLOSE to it, which means it’s ridiculously delicious and also something I could eat ever single day from now until eternity. Here’s what I know about their quiche that brought this recipe together. The filling is simply cream, eggs and cheese. It’s on the fluffier side, so I know that the amount of eggs used is minimal. It’s ridiculously cheesy, so I know that skimping on the amount of nutty gruyere and mild emmental would be a colossal mistake. For my first try, I used 1 ½ cups of cream to five eggs to two cups of cheese, which yielded a similar tasting quiche, but was still too dense for my liking. The second try, I used 1 ½ cups of cream to three eggs to two cups of cheese which yielded a soufflé like texture – still not there. On my THIRD try, I used 1 ½ cups of cream to four eggs to two cups of cheese, and this time, it was pretty perfect. 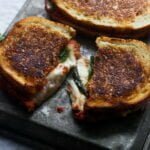 The third batch was light and fluffy, with a sharp cheesy taste in every single bite, and aside from the crisp crust, literally melted in my mouth – everything I’d been trying to achieve. A couple of notes. 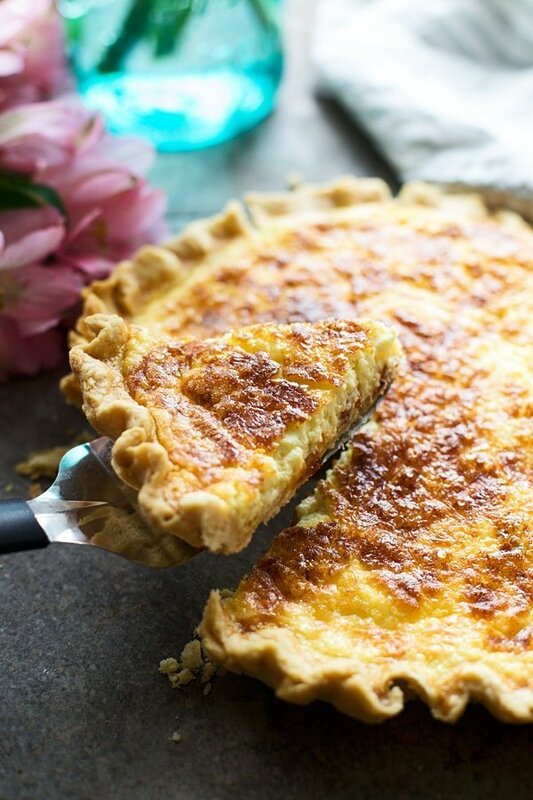 It’s VERY important to get high-quality sharp gruyere and emmetal cheese, because aside from the cream to egg ratio, the flavor of the cheeses is what makes this quiche shine. Sharp gruyere has this irreplaceable nutty, strong flavor you can’t replicate in any other cheese, and emmental is super mild, but gives the quiche that hint of swiss flavor classic to a lorraine. 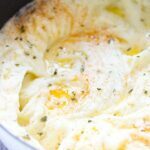 Also, I have listed several tips in the recipe on how to make the perfect pie crust, and if you follow them correctly, you should have a perfect crust every time! I happen to love the flakiness shortening gives a pie crust, but obviously butter is so much more flavorful, so I like to use a combination of the two. Make sure to earmark this for your next brunch, baby or bridal shower, and I promise everyone will leave totally smitten, with you and with quiche. Add flour and salt to a large bowl. Whisk to combine and aerate the flour. Add shortening and COLD butter to the flour. Use a pastry cutter or fork to cut the fat in to the flour. It's ready when there are still some pea size pieces of fat in the flour and the mixture looks shaggy. Drizzle one tablespoon of ice water over the mixture and use a fork to gently stir twice. 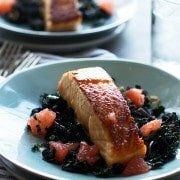 Drizzle the next tablespoon over and repeat. Drizzle one last tablespoon over and use the fork to mix the dough. You should only need three tablespoons, but the dough is not coming together, add another. DO NOT OVERMIX the dough! Once the dough has almost formed, quickly use your hands to form the dough into a disc. Try to make sure there aren't any cracks. Wrap in plastic and let rest for at least one hour. While the dough chills, preheat the oven to 350 degrees. Grease a 9-inch ceramic or metal pie pan with non-stick cooking spray. Once dough has rested. Roll out dough on a lightly floured surface. Use a lightly floured rolling pin and roll from the center out, turned the dough 45-degrees each time your roll to keep the dough in a circle. Roll the dough out so it goes about ¼ inch over your pie plate, you want the dough to hang off the edge when you put it in the pie plate. Gently transfer the dough to the pie plate (I like to roll it on the rolling pie to avoid tearing the dough, if you do tear it, no big deal, just gently put it back to together). Do not stretch the dough! Fold the edges under the dough so you have a thick crust. Crimp the edges. Use a fork to prick the bottom. Place the crust in the freezer for 15 minutes (this helps to avoid shrinkage). For the filling: Cook bacon in a skillet until crisp. Drain and chop into fine pieces. Set aside. 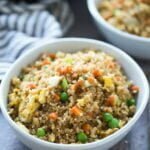 Add eggs to a food processor. Pulse a few times to whip. Add heavy cream and salt. Pulse another 2-3 times to combine. In a small bowl, combine cheeses. Cover the crust in the cheese. Pour the egg and cream filling over. Bake for 35 minutes or until golden brown, and cooked through. (There will still be a slight jiggle to the quiche.) Let rest for 10 minutes before serving. 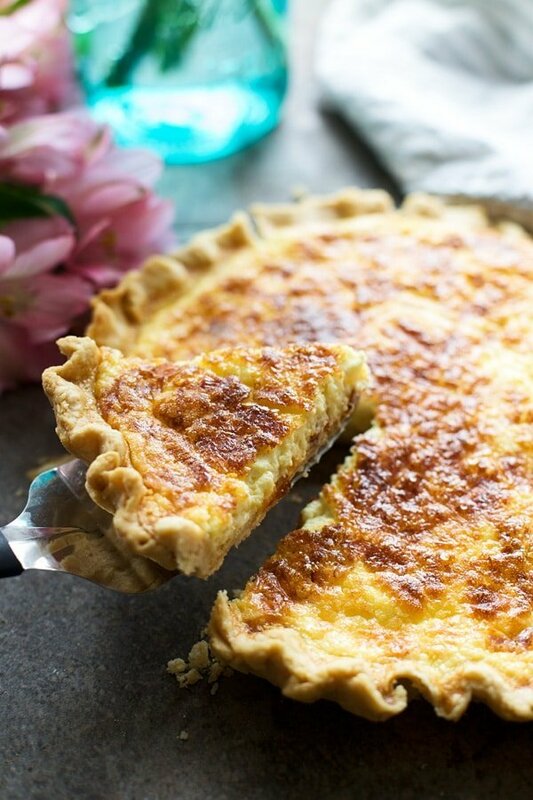 8 Responses to "Best Ever Quiche Lorraine"
Your quiche looks just like Andres.!!!! Can’t wait to make it!!!! Sounds amazing! There’s a quiche cook-off at work and I’ve been scouring the internet for inspiration. 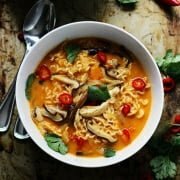 Thanks for the recipe and explanation! Consider trying 3 eggs & 2 egg yolks. I’ve seen it in other recipes and it might be why your 4 eggs is pretty perfect but maybe just slightly different from Andres. I will definitely try that next time around. Thanks Eric!! I just made it and it was delicious and to be honest I have never been big on quiche. I made it for my husband and boy am I glad I did. Well done. So glad you liked it Carmen! 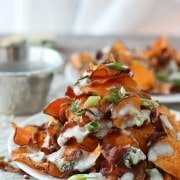 Super recipe but you forgot to add the bacon. 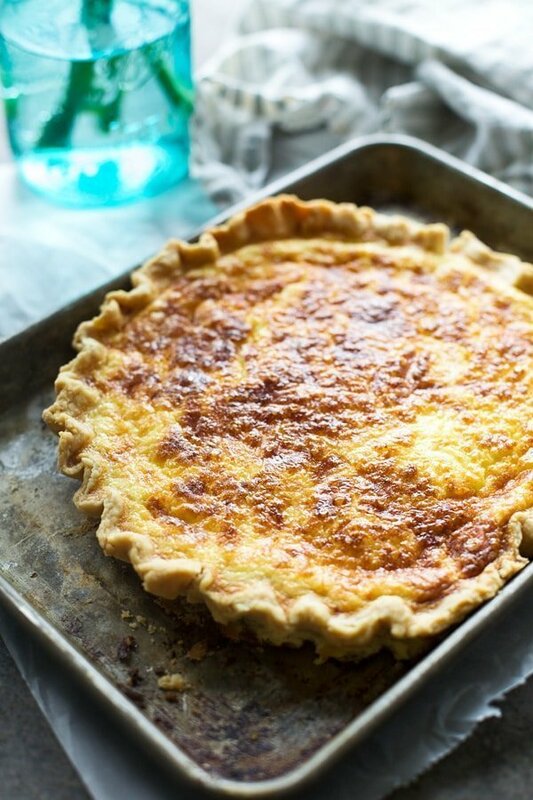 AND Try brushing the unbaked crust with mustard, and grate some nutmeg into the milk/eggs mixture. Extra delicious.